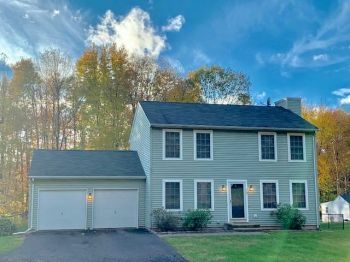 AN ATTRACTIVE CLASSIC COLONIAL WITH A FRESH AND YOUNG FEEL! THIS 3 BEDROOM/2.5 BATH HOME IS BRIGHT, AIRY AND HAS BEEN LOVINGLY MAINTAINED. THE HOME HAS SO MANY PRETTY TOUCHES-FRESHLY PAINTED INTERIOR WITH NEUTRAL STYLISH COLORS,CROWN MOLDING,HARDWOOD FLOORS, GAS FIREPLACE AND NEWER CARPETING UPSTAIRS. THE KITCHEN IS REMODELED W/ STAINLESS STEEL APPLIANCES AND OPENS DIRECTLY INTO THE DINING ROOM. THE OVERSIZED LIVING ROOM HAS RECESSED LIGHTING AND GIVES YOU DIRECT ACCESS TO THE SPACIOUS DECK. THE MASTER BEDROOM SUITE OFFERS A WALK-IN CLOSET AND BEAUTIFUL FULL BATH! THE UNFINISHED BASEMENT IS PERFECT FOR ALL YOUR STORAGE NEEDS. CENTRAL AIR, NEWER WINDOWS AND FURNACE. YOU WILL FIND THE OUTSIDE JUST AS APPEALING AS THE INSIDE. THE HOME SITS ON HALF AN ACRE AND IS FULLY FENCED. THE DECK IS AMPLE SIZE AND THE SHED OFFERS EVEN MORE CONVENIENCE. HOME SWEET HOME!